I wish I could clearly state what this book has meant to me, the twisting thought trails and brambled thickets surrounding writing and struggle and humanity it has uncovered, the old sadnesses it has opened and the new ones it has instilled. It is a gift, and one that came at great cost to its author. The older I get the more I realise that saying things out loud or writing things down does not always help you. These pages were not for Feraoun, they were for us. I have only scattered ways of marshaling my thoughts, they do not do justice to the ways that we have traveled together, Feraoun’s words and I. His pain shared at one remove as the days of this first Algerian war for independence progressed. I was thinking about grouping things thematically, but this progression over painful time must be honored I think. Reading this after Horne’s A Savage War of Peace, what first emerged most strongly to me was the necessity of freeing oneself inside and out from the conquerors, but god the complexities of this. The tragedies. The grief at watching the abyss between peoples grow, knowing it must in the cold light of that original colonial relationship translated into years of continuous oppression. Watching, without turning away, the damage it causes to those inflicting as well as receiving it. This time I saw clearly the glint of malice in his eyes that is so typical of the fellagha in our region. For them, the teacher is both educated and naive, a man with good advice who can inform you about laws and regulations and yet believes everything that you tell him. …as soon as it is legitimate to judge them as a group, it is no longer troubling for anyone to point out their faults. It is no longer a question of Mr Eugène or Jojo but of the triumphant Frenchman who has taken over his place and gotten rich off our backs. Once you buttress yourself with generalities, you are amazed to discover some very broad horizons. …there is now an impassable breach between us; a rupture that both sides deplore but also endure, knowing that it is inevitable. We avoid talking politics. Our French colleagues are, however, quite tactful. When they comment on a crime, a bomb, an attack, or when they speak about their fears, they always assume that we are on their side, that our fates are identical, in short, that we are just as French as they are. We tolerate the assumption, and everyday life remains bearable. You feel that this crowd is wrapped in a new dignity as stiff as a new suit. A suit cut and made to measure, for which everyone is determined to pay the price. And this, when will this ever cease to be true? The rebels’ expectations are both excessive and disappointing. They include prohibitions of all kinds, nothing but prohibitions, dictated by the most obtuse fanaticism, the most intransigent racism, and the most authoritarian fist. In a way, this is true terrorism. There is nothing left for the women of T.A. [ referring to the mosque which this story is describing] except to shrill with enthusiasm in honor of the new era of freedom that they seem to perceive beyond the foggy horizon that our dark mountains inexorably obstruct. There are several stories like this one that are making the rounds. In the future they will be worthy of becoming folk stories. This is how people create History. Another trail leads from this along the tracks of history and its makings, but this is already too long. I read anger and hatred in their eyes. there they were, all four of them ready to contradict me, all four ready to insult me with their arrogance, all four of them ready to put me in that category that they despise, that they exploit, that they would massacre, and that they fear. A crazy fear. Here insights into village life, the need to know what is happening in this place you belong in a sense, for all the complications of that and even if you are far away. I have received news from back home. Amar spent the night here, and we talked. He began talking, going back in time, one day at a time…I was happy. There are no more empty moments in my mind, and I am able to imagine what it is like without any difficulty. This…this exposition, a day’s entry written entirely in the voice of a French settler, it is so chilling. Both for what it meant for Algeria, but for how precise an echo it is of U.S. whites, whether on African Americans or Indigenous peoples and whether two hundred years ago or today. All I do is ignore them — well, almost. Why are they now rising against me? All they had to do was get themselves a job, just like I did. They are unhappy, they are always unhappy. Is it my fault, damn it? I agree that I have always been aloof with them and that, in my mind, I cannot get used to the idea that they are my equals. I have to admit this with total sincerity, and admit just as sincerely that, deep down, we settled here as winners, that consequently we are the race that rules, that must serve itself first. Why deny it? And, in all modesty, I never display this attitude, and generally we all have enough tact so that life is bearable for the Arabs, and we all deal with enough good faith to give to the best of them almost everything they deserve, especially the more obedient ones. But these people want everything…. Will they be trapped in one or other of two molds that are separated by an abyss from which one can only escape as a traitor? I am reading a few notes about the torture methods used by the Algerian police. I got this from a reliable witness, an intelligent and idealistic young man who looks a bit weary and carries in his eyes the immense distress of those who suffer, of those who have stopped calling for help because they know they are wasting their time. However, they still have hope of finding justice by their deeds. I sat on the bus with tears rolling down my cheeks reading of the torture. I cannot bear the thought that one human can do these things to another. Working with refugees from Central America all those years ago, I know the marks it leaves. I still see their faces whenever I read these things and my love for them chokes me. Up to now the rebels were aiming to right wrongs; now they are claiming to defend great principles. We have been relieved of the heavy burden that was choking us: the burden of our common hypocrisy, which is as old as our common history. We are gradually becoming insensitive, just like those who, privilged by fate, become luckily immune to contagion while providing devoted care to others who suffer from them. We may well be spared from the epidemic, but we will not be grateful. The village [Tizi-Hibel] has lost almost all of its young men…People are leaving in anticipation of another police sweep, and able-bodied men no longer dare to sleep at home. They leave at sunset. I no longer dare to go out for news. We are all suspects. I came back from Algiers with Djidj the day before these assassinations. Before reaching Tizi-Ouzou, we were checked six times. 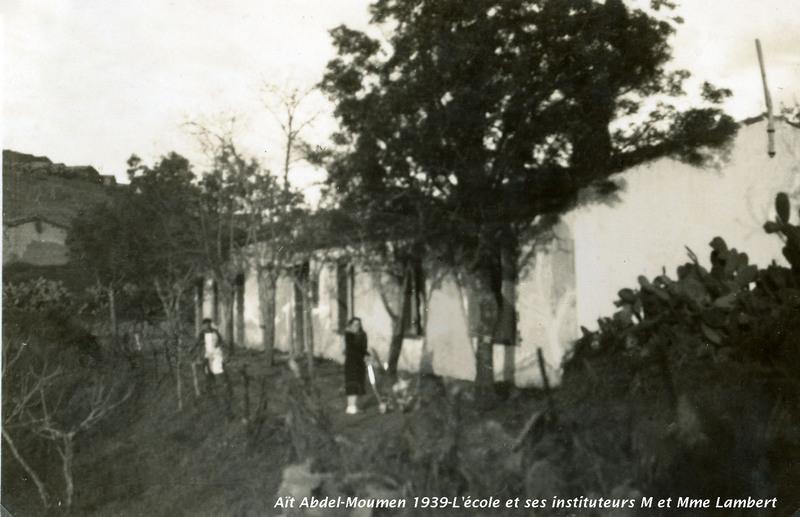 From the turns in the road shaded by eucalyptus trees extending from Haussonvillers toward Camp-du-Maréchal, one could see three villages that were burning on the Bou Segza-Sidi Ali Bou Nab. Old and young Kabyle women and children were waiting on the side of the road with shapeless bundles at their feet. They have evacuated the population over there in order to fight a real war. The spring sky cannot dispel the sadness from these drab images. It is difficult to condemn or approve the dispensers of justice. It is just as difficult to expect a kind of infallibility that is not within man’s scope. The heart bleeds, however, when it witnesses this kind of spectacle: today’s executioner inescapably becomes tomorrow’s victim, and this, in turn, will call for another executioner. I listened to him as he told his story for the hundredth time. He feels that, as long as he lives, he has to tell it. It is as if he now has nothing else to do in this absurd world where our lives have no more value or meaning than those of wild beasts in the eyes of well-equipped hunters. It has been a year since I started writing down my feelings. God knows that I did not lack material, but I was short on desire, taste, and drive. I did not write down everything, of course. Only guide posts, so that later, if my life is long, I will still be able to fee the sad memories of the dark years, of the gloomy days. This. This sentence true of so many peoples in so many places. Each one of us is guilty for the sole reason that we belong to a category, a race, a people. you fear that someone will make you pay with your life for your place in the world, pay for the color of your skin. You fear that someone will attack you only because nobody has done it yet. I receive letters from Roblès on a regular basis. At a time when a sense of camaraderie and friendship is failing me, his has remained fraternal and strong. Roblès is more than just a friend or a Frenchman. I cannot connect him to any motherland because he is from everywhere, and that is exactly where I come from, poor friend. The UN conference on the Algerian question will open in a week. Here in Algeria, and insurrectionary strike — one that the French are trying to quell — will start simultaneously. We understand the sacred character of this strike. The Algerians must proclaim their suffering and anger to a world that hesitates to believe them. Those sickly sweet and hypocritical voices that will protest their innocence and will overwhelm us with imaginary kindness–fanatical and ungrateful that we are–must be drowned out by our shouts, the shouts of those who are skinned alive, the shouts of those who are afraid, and the groans of those who are dying. The best possible scenario would be if all our dead crossed the Atlantic so their sinister laughter might be heard at the tribune of the UN, behind the Parisian sirens who already flatter themselves with having seduced Uncle Sam. I wish my people–my country–all the happiness of which it was deprived and all the glory it is capable of achieving; when I have witnessed its blossoming, its joy and pride, I will be able to despise my patriotism just as I despise other examples of patriotism. I am one of these complicated people who learned a lot of useless things in school. These useless things make me, as well as others like me, physically ill, and all of us together become strangers in our own land. I had already encountered another SAS officer a long time ago who, acting on the same prejudice, wanted to deny us everything. This particular wretch would talk every chance he got about his exploits in the French Resistance in an effort to persuade us that our situation was not the same. It sometimes happens that some poor fellow’s nerves suddenly snap, and as he becomes submerged in a state of lucid madness, he begins to talk and talk and talk. At the djemaâ, in the cafes–everywhere–he says exactly what he thinks about “his brothers”. The people watching him become alarmed and try and feel sorry for him. They know that it is futile to try and stop him. If they enjoy listening to him, it is because, in a sense, he reads his words from their hearts…No, it will not last long. One fine morning, he disappears. …it is always the fellagha who, no matter what they do, inspire confidence and win hearts. No matter what they do, they are still soldiers fighting the enemy, soldiers doomed to a certain death because they are defending the country. I think that I am content to limit myself to an objective reporting of the facts as I see them unfolding in front of my eyes. Later on, this will allow me to recreate the atmosphere. Of course, that is if I live long enough. To Horne the youyous were a signal of otherness, of eerie disregard, I knew they were not. A rational fellow told me that the rage of the French in Algeria is out of control. Their rage is filled with hatred and fear, but not madness. They have money, and they use it to pay ruthless commandos to go terrorize the Arabs at night during curfew: they bang on doors, brutalize or kill people, and start fires. They must have lists and get specific orders. These people are killers. The Arabs fight back by yelling youyou and counterattack with bottles filled with water, pebbles, and sticks. As soon as someone knocks on your door, start youyouing but do not open your door; your neighbors will cry youyou also, and then others will do the same. When the alert has been heard everywhere in the vicinity, you must come out and make threats. Then the black 403 Peugeot or the D.S. Citroen of the same color will hightail it into the night, with its cargo of rowdies wearing civilian clothes or paratrooper outfits. This reminded me of El Salvador again, the precise descriptions of the vehicles carrying death squads, the assumption that everyone knows the meaning of the Ford Bronco pulling up to your door and me knowing the immigration officer would require more proof as a political matter. I have spent hours upon hours rereading all of my notes, newspaper articles, and small clippings that I have kept. I have become reimmersed in a sad past, and I am leaving it overwhelmed. I am frightened by my candor, my audacity, my cruelty, and, at times, my blind spots and prejudice. Do I have the right to tamper with what I have written, to go back, to alter or rectify it? Did I not write all of this day by day, according to my frame of mind, my mood, the circumstances, the atmosphere created by the event, its reverberations in my heart? And why did I write it like this, bit by bit, if it was not to witness, to stand before teh world and shout out the suffering and misfortune that have stalked me…. He was killed by the fascist OAS on March 15, 1962 but he is not forgotten. Mouloud Feraoun, presente.